Fajada Butte – Rising some 400 feet above the canyon floor, Fajada Butte, at the entrance of Chaco Canyon, is visible for miles. 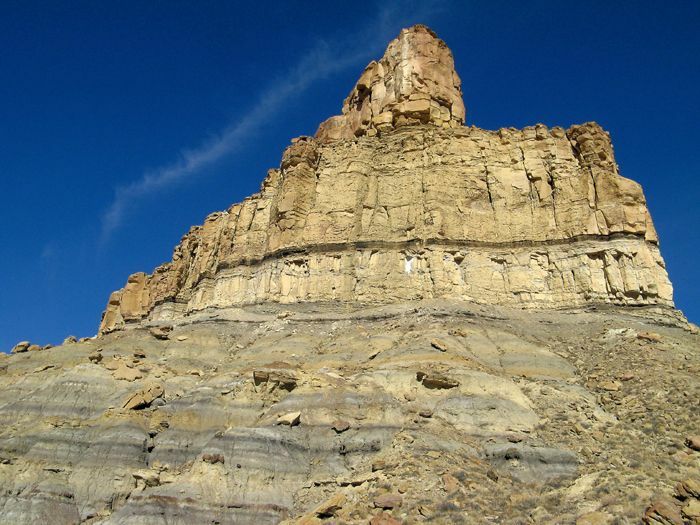 High atop the imposing butte is a set of spiral petroglyphs carved into the cliff face behind three giant slabs of rock. Functioning as a solar marker, a vertical shaft of light pierced the main spiral at its center. The site, known as the Sun Dagger, was discovered by Anna Sofaer in 1977 who conducted an extensive investigation and published results showing how the spirals may have tracked the lunar cycle. Unfortunately, in 1989, the rock slabs shifted and the effect was ruined. The rooms, though to have been used by Chacoan astronomers, was also a place of worship. 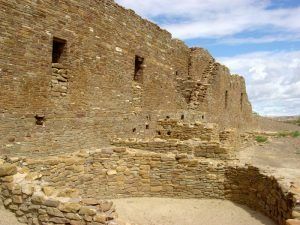 The loss of the sun dagger prompted the World Monuments Fund Chaco Culture National Historical Park to its Most Endangered Monuments list in 1996. Today, the site is closed to visitors. Hungo Pavi: “Reed Spring Village” is located just about a mile from Una Vida at the junction of Chaco and Mockingbird Canyons. Thought to have been built around 1000 A.D., the medium-sized pueblo contained some 73 ground-floor rooms, two kivas in the structure that reached four stories in height. It lies at the base of a prehistoric stairway which leads up the mesa and an ancient road linking it to the Chacoan road system. 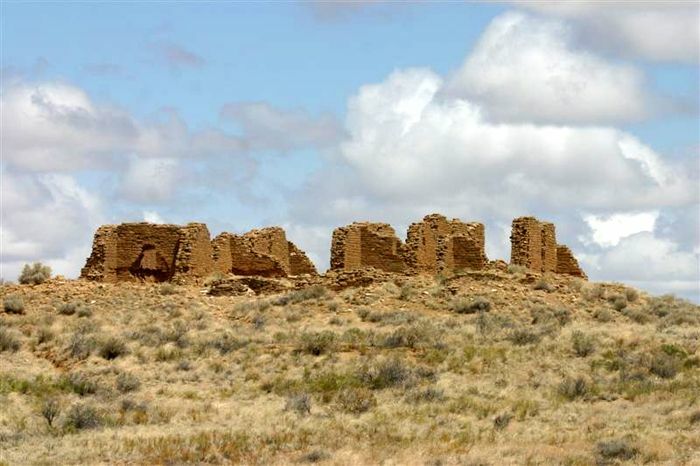 Kin Kletso: Located about 1/2 mile west of Pueblo Bonito, Kin Kletso was built in two phases between 1125 and 1130 A.D. by people who came to Chaco Canyon from the Northern San Juan Region. The walls were made of large shaped sandstone blocks laid two or more rows thick. The medium-sized pueblo called the “Yellow House” by the Navaho, contains around fifty-five ground level rooms, four kivas, and a tower kiva. Excavated in the early 1950s, evidence of an obsidian production industry was found here. Kin Nahasbas: This isolated great kiva was constructed during the middle 1000’s. Nestled against the north Mesa, the ruins are located just north of Una Vida. New Alto or Nuevo: Located just east of Pueblo Alto, the Pueblo was one of the latest ones constructed in the late 1100s. Despite a decrease in the population in the rest of the canyon, the pueblo contained some 28 rooms and a kiva. It is speculated that it may have been built by Indians who had migrated from the Mesa Verde area. Peñasco Blanco: Blanco, Spanish for “white cliff,” is a large arc-shaped great house built in five different stages, between 900 and 1125 A.D. One of the first large pueblos built in the canyon, the ruins display the development in Chacoan masonry through the centuries. Sitting atop the northernmost point of West Mesa, the pueblo overlooks the confluence of the Chaco and Escavada Washes. 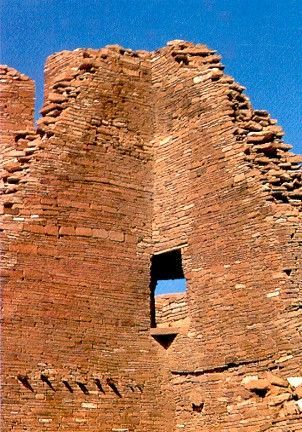 Reaching up to four stories tall, the pueblo contained approximately 160 ground-floor rooms, two great kivas in the central plaza, and two more located outside the pueblo. 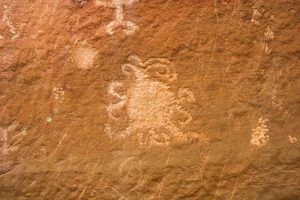 Near Peñasco Blanco is a well-known cliff painting that contains a crescent moon, a ten-pointed star, handprint, and a sun sign. Catching the attention of astronomers, many have speculated that the pictograph represents the sighting of a supernova in July 1054 A.D. or the appearance of Halley’s comet in 1066 A.D.
Pueblo Alto: Located on a mesa flat due north of Pueblo Bonito, this great house is thought to have been built between 1020 and 1050 A.D. Serving the area residents as a community house, archeological evidence suggests periodic episodes of occupancy and feasting. It has been estimated that only five of the 85 rooms were constructed for permanent residents, while the others were utilized for community events and industry, including bead and turquoise processing and chert tool production. Ancient stairs lead from the large pueblo to the top of the mesa. Pueblo Bonito: This D-shaped pueblo is the largest Great House in the park spanning nearly two acres and believed to have once been as tall as five stories. The approximately 650 rooms surrounded the central plaza and throughout the settlement were about 40 kivas and numerous meeting places that served ceremonial purposes. The pueblo was occupied from the mid-800s to the 1200s, with about 1,200 people at its height. Pueblo Bonito is one of the most extensively excavated and studied sites in North America and is considered sacred by many Native American groups. Pueblo del Arroyo: Located near Pueblo Bonito at the side drainage known as South Gap, the pueblo was built in stages over a relatively short time. The central portion was built around 1075 with the north and south wings, the plaza and tri-walled structure built in the early years of the 12th century. The building once boasted approximately 280 rooms and more than 20 kivas. Tsin Kletzin: Dating back to the early 1100s, Tsin Kletzin is located on the south mesa top above Casa Rinconada. The unexcavated great house lies near a large earthenware structure known as the Weritos Dam, where it is believed the ancient Ancient Puebloans obtained water. Because Tsin Kletzin has two roads leading to it from the north but no roads continuing southward, it is thought that it served as a destination point. Una Vida: This Chocaon public building, closest to the Visitor’s Center, was one of the earliest constructed beginning sometime in the mid-800’s. Construction is believed to have continued on the great house up until the late 1000’s. Una Vida includes approximately 150 rooms and five kivas. 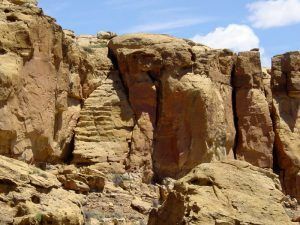 The great house was known to the Navajo as “witchcraft woman’s house” due to its association with a well-known legend where a witch held hostages atop Fajada Butte without food or water. 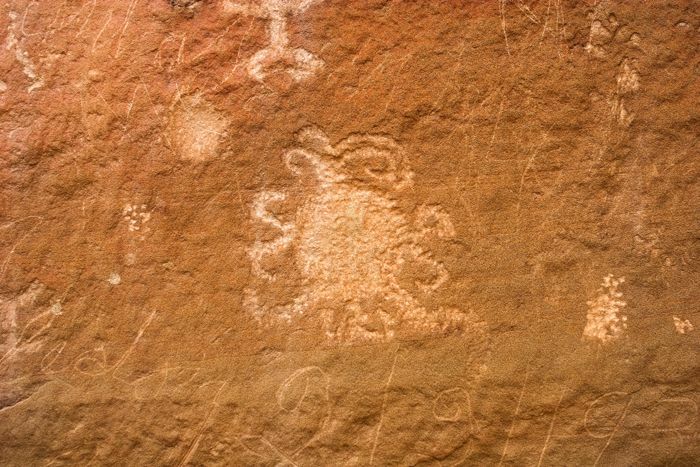 On the cliff face behind Una Vida is an Ancient Puebloans pictograph which displays humanoid and geometric forms, and four-legged animal shapes possibly big horned sheep. Wijiji: With just over 100 rooms, Wijiji is the smallest to the great houses, thought to have been built around 1110 A.D. Located in a narrow wash about a mile from Una Vida, the site appears to have been utilized in part as a calendrical station. 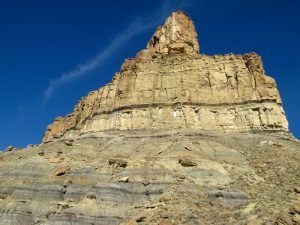 Because of the aridity and remoteness of the San Juan Basin, Chaco’s record of evolving complexity is almost unrivaled in its preservation and continues to testify to the organizational and engineering abilities not seen anywhere else in the American Southwest. 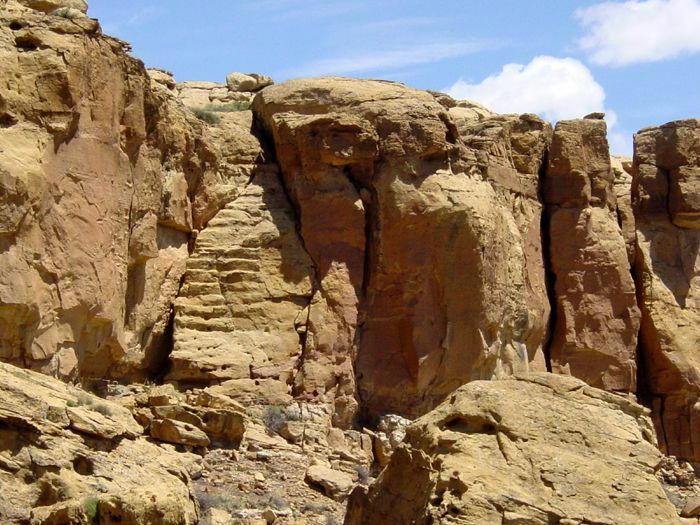 Today, Chaco Canyon is a UNESCO World Heritage Site and some locations are off-limits to the public due to erosion and because they are considered sacred ancestral homelands by the Hopi and Pueblo people. The National Historical Park also provides guided tours, hiking & biking trails, camping, and night sky programs. The park is situated on the Trails of the Ancients Byway, one of the designated New Mexico Scenic Byways. Chaco Canyon is located in northwestern New Mexico. The preferred and recommended access route to the park is from the north, via US 550 and County Road 7900, and County Road 7950. From the north, turn off US 550 at CR 7900 three miles southeast of Nageezi and approximately 50 miles west of Cuba (at mile 112.5). This route is clearly signed from US 550 to the park boundary (21 miles). The route includes five miles of paved road (CR 7900) and 16 miles of rough dirt road (CR 7950). All sites and trails are open from sunrise to sunset.